Wow!!! Two colorful women with colorful lives!!! Love them both.... Strong, classy, and sophisticated! Girl Power! Hope to see more of you Kris & KC!!! The power of women partnership/solidarity cannot be underestimated. Go, KC and Kris! Use your "visibility"/media power to promote meaningful women causes/advocacies via a collaborative show for women. Bagay silang mag sama sa isang show. Smart, witty, sophisticated. It's been along time coming!! Love KC so much! She is very refreshing to watch ! Ang sarap nilang panoorin sa kris tv right now,so beatiful,ganda ni kc pati nails niya ganda,so classy ng dress niya bagay sa kanya,more power kc? 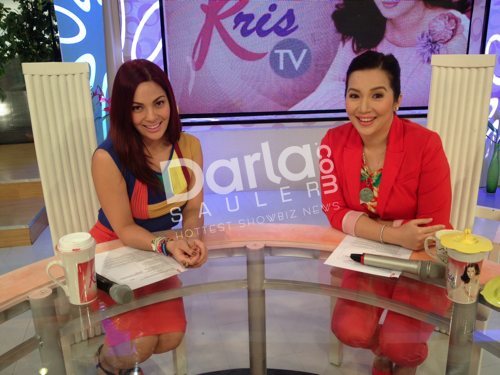 Miss Darla,everyday na ba si kc sa kristv? Here's wishing KC will be given projects commensurate to her talents and persona. Earlier in her career, and in her post-college graduation interviews, she showed quite endearing spontaneous sense of humor, openness/honesty, which she brought out in her Simply KC show. She has a unique childlike/kind/graceful aura about her. She should remain fearless showcasing her artistry in dance/pioneering innovative and creative ideas, high ideals tempered with practical sense, which were evident especially earlier in her career. Collaborate with people who believe in your limitless talents, KC. When you find your niche in the Philippine entertainment industry, sky is the limit for you! Here's hoping, that KC will be given projects/shows tailored to, and which can harness her unique cultural exposures, ethereal persona and unique talents. Just noticed that because of her parentage, despite her abundant talents, and a good, compassionate heart, she has to try harder than most celebrities of lesser caliber. She has this enticing beauty, which the camera loves, great potential that can be harnessed to greater heights. All that is needed is a right project/show for her that can tap these gifts. She is unlike any other celebrity. I love KC very much! !She's very talented, always humble and unique beauty inside and out...more power..
can we have more of kc and kris? theyre a great tandem!